Sawgrass Virtuoso SG400 Sublimation System w/ SubliJet HD Carts! 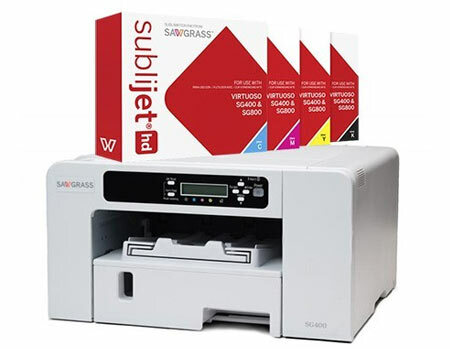 Home > Sawgrass Virtuoso SG400 Sublimation System w/ SubliJet HD Carts! Virtuoso SG400 inkjet sublimation printers deliver dazzling HD photo-quality prints up to 8.5" x 14" as part of the complete Virtuoso HD Product Decorating System. A fantastic choice for start-up decorators or kiosk applications. The only desktop inkjet printer optimized for digital decorating and SubliJet-HD inks. The first sublimation printer co-engineered with Ricoh. Lowest start-up cost of any commercial product decorating technology. Higher definition image reproduction with vibrant, true-to-life colors. Faster throughput for greater productivity. Prints nearly 2 times faster than the Ricoh SG 3110DN - Up to 156 prints per hour. Built-in self-cleaning routine keeps the printer running at its best, ensuring maximum uptime with minimal power and ink consumption. Note: *Only Windows Professional, Business, Enterprise and Ultimate Editions have been tested and approved. Only select drivers for Windows 8 are available. **Only compatible with Intel systems running Macintosh OS 10.5 or later, current with the absolute latest Apple software updates. Sawgrass Extended Warranty Coverage for US Virtuoso SG400 printer owners. Computer Compatibility & Requirements - Click Here! Click here for sublimation inks!